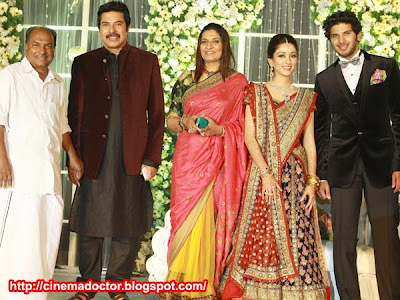 Malayalam film superstar Mamootty and his wife Sulfath hosted a grand reception in celebration of the marriage of their son Dulquar Salman with Amal Sufiya. They had invited their friends, relatives and colleagues from the film industry at Kochi Ramada resort on Monday, December 26, 2011. Mammootty along with wife Sulfath hosted a reception in Kochi to celebrate the wedding of their son Dulquar Salman with Amal Sufiya. The two had got married in a private ceremony in Chennai last Thursday. Littérateur M.T.Vasudevan Nair, directors Adoor GopalaKrishnan, Joshi, Blessy, B and Shaji Kailas were among the many who attended the function. Among actors, Jagathy Sree Kumar, Jayaram, Dileep, Mukesh, Manoj K.Jayan, Kunjacko Boban, Prithviraj, Jayasurya, Mamu koya, Suraj, Kailash, Anoop Menon, Saiju Kurup, Kunchan, Kavya, Samvritha, Menaka, Bhama, Bhavana and KPAC Lalitha blessed Dulquar Salman with Amal Sufiya. Singer Vijay Yesudas and many dignitaries from all walks of life attended the function.